The lure of social media advertising is massive: As brands look across a fractured media landscape, social networks offer them an interesting proposition. Social networks have scale – enormous user bases and deep databases. They have high engagement – Americans were spending an average of 12 hours per month on social networks as of July 2012, with 18-24 year olds averaging 20 hours. And potentially, social media gives brands offer a uniquely captive audience for their content. Guaranteed placement is getting advertisers to pay up: Brands are paying to get their content or copy in front of a quantifiable audience, an increasingly rare feat in an era of scattered consumer attention. This desire for guaranteed attention also helps to explain social media’s move away from traditional display ads — like Facebook’s right-rail ads — and toward so-called native ads that surface in a user’s stream, either as a tweet or a Facebook post. A consensus seems to be forming around in-stream advertising as the most promising social advertising format. Increased mobile usage will be a huge growth driver: The BIA/Kelsey prediction calls for mobile to account for only $2.2 billion of that in 2017 – a 20% market share. This could easily be surpassed. Both Twitter and Facebook have passed the 50% mobile usage mark and, given the continued growth of mobile devices, it will only rise. Mobile accounted for 11% of Facebook’s ad revenue last year even though it didn’t release mobile ads until the tail end of the second quarter. By the fourth quarter, it was up to 23%. And now, Twitter is reporting that its mobile ad revenue now regularly outpaces its desktop ad revenue. 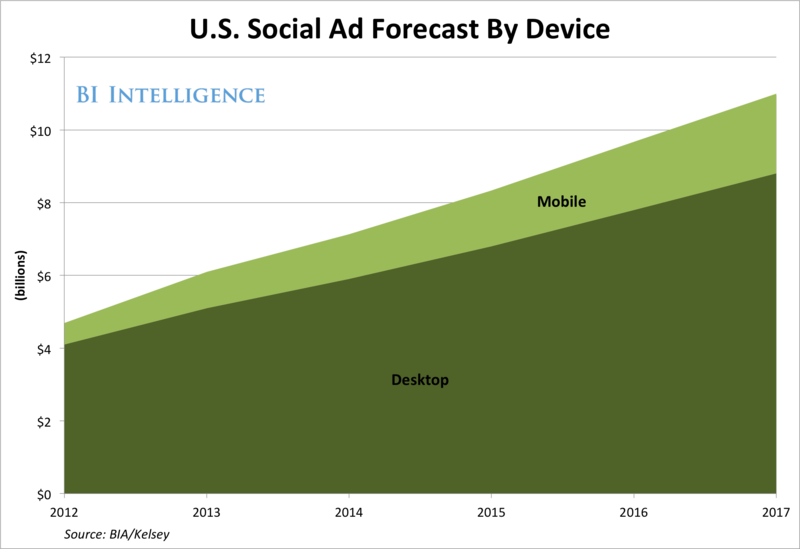 Social media advertising is therefore uniquely positioned to grab an increasing share of the fast growing mobile advertising market. Aside | This entry was posted in Social Media, Technology and tagged Social Media, Technology. Bookmark the permalink.